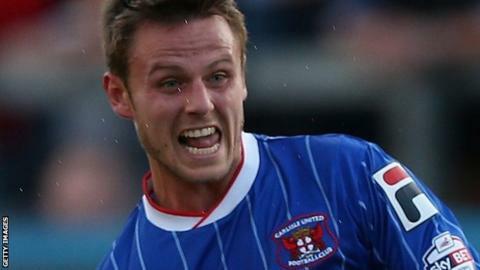 James Berrett's strike handed already-relegated Yeovil a shock win at promotion-chasing Swindon Town. Ben Gladwin curled a right-footed shot against the post from outside the box as the Robins dominated early on. But the Glovers took a surprise lead when Berrett shot into the bottom corner from the edge of the box. Josh Sheehan sliced the ball off the line and onto his own crossbar to clear for Yeovil before Swindon had a penalty claim dismissed late on. The defeat saw Swindon remain in fourth place, now seven points behind second-placed Preston. Already-relegated Yeovil have now won two and drawn one of their three games under new manager Paul Sturrock, but still occupy the bottom spot in League One. "When you have that many players off colour you can't expect to win a game. "We didn't do enough today in the final third, we were poor. "Yeovil come here and get people behind the ball. They're fully entitled to do that. "We've picked a bad time to fluff our chance." Match ends, Swindon Town 0, Yeovil Town 1. Second Half ends, Swindon Town 0, Yeovil Town 1. Corner, Swindon Town. Conceded by Artur Krysiak. Ben Gladwin (Swindon Town) wins a free kick in the defensive half. Foul by Josh Sheehan (Yeovil Town). Sam Ricketts (Swindon Town) wins a free kick on the left wing. Foul by Seth Nana Ofori-Twumasi (Yeovil Town). Corner, Yeovil Town. Conceded by Jack Stephens. Massimo Luongo (Swindon Town) wins a free kick on the left wing. Attempt missed. Yaser Kasim (Swindon Town) left footed shot from outside the box is just a bit too high. Substitution, Yeovil Town. Gozie Ugwu replaces Kieffer Moore. Substitution, Yeovil Town. A-Jay Leitch-Smith replaces Joel Grant. James Berrett (Yeovil Town) wins a free kick in the attacking half. Attempt missed. John Swift (Swindon Town) right footed shot from the left side of the box is close, but misses to the left. Attempt missed. Josh Sheehan (Yeovil Town) right footed shot from the centre of the box is close, but misses to the left. Attempt saved. Massimo Luongo (Swindon Town) left footed shot from outside the box is saved in the top centre of the goal. Substitution, Swindon Town. John Swift replaces Anton Rodgers. Corner, Swindon Town. Conceded by Liam Shephard. Attempt missed. James Berrett (Yeovil Town) right footed shot from outside the box is close, but misses to the left from a direct free kick. Joel Grant (Yeovil Town) wins a free kick in the defensive half. Anton Rodgers (Swindon Town) wins a free kick on the right wing. Seth Nana Ofori-Twumasi (Yeovil Town) wins a free kick in the defensive half. Substitution, Swindon Town. Andy Williams replaces Michael Smith. Attempt blocked. Jonathan Obika (Swindon Town) right footed shot from the centre of the box is blocked. Corner, Swindon Town. Conceded by Stephen Arthurworrey. Foul by Jack Stephens (Swindon Town). Kieffer Moore (Yeovil Town) wins a free kick in the defensive half. Substitution, Swindon Town. Yaser Kasim replaces Harry Toffolo. Goal! Swindon Town 0, Yeovil Town 1. James Berrett (Yeovil Town) right footed shot from outside the box to the bottom left corner. Attempt blocked. Kieffer Moore (Yeovil Town) right footed shot from outside the box is blocked. Attempt saved. Jonathan Obika (Swindon Town) left footed shot from outside the box is saved in the centre of the goal. Seth Nana Ofori-Twumasi (Yeovil Town) wins a free kick in the attacking half.